Since we’re already depressed by the enactment of Obamacare, we may as well wallow in misery by looking at some long-term budget numbers. The chart below, which is based on the Congressional Budget Office’s long-run estimates, shows that federal government spending will climb to 45 percent of GDP if we believe CBO’s more optimistic “baseline” estimate. 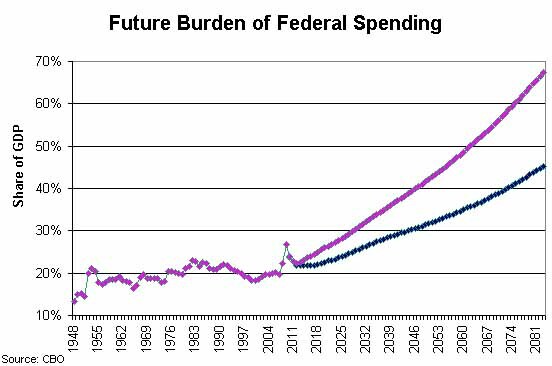 If we prefer the less optimistic “alternative” estimate, the burden of federal government spending will climb to 67 percent of economic output. These dismal numbers are driven by two factors, an aging population and entitlement programs such as Medicare, Medicaid, and Social Security. For all intents and purposes, America is on a path to become a European-style welfare state. If these numbers don’t depress you enough, here are a couple of additional observations to push you over the edge. These CBO estimates were produced last year, so they don’t count the cost of Obamacare. And as Michael Cannon repeatedly has observed, Obamacare will cost much more than the official estimates concocted by CBO. And speaking of estimates, the long-run numbers in the chart are almost certainly too optimistic since CBO’s methodology naively assumes that a rising burden of government will have no negative impact on the economy’s growth rate. Last but not least, the data above only measures federal spending. State and local government budgets will consume at least another 15 percent of GDP, so even using the optimistic baseline, total government spending will be about 60 percent of GDP, higher than every European nation, including France, Greece, and Sweden. And if we add state and local spending on top of the “alternative” baseline, then we’re in uncharted territory where perhaps Cuba and North Korea would be the most appropriate analogies. So what do we do? There’s no sure-fire solution. Congressman Paul Ryan has a reform plan to reduce long-run federal spending to less than 20 percent of GDP. This “Roadmap” plan is excellent, though it is marred by the inclusion of a value-added tax. Bill Shipman of CarriageOaks Partners put forth a very interesting proposal in a Washington Times column to make the federal government rely on states for tax revenue. And I’ve been an avid proponent of tax competition as a strategy to curtail the greed of the political class since it is difficult to finance redistribution if labor and capital can escape to jurisdictions with better tax law. Any other suggestions? 20% reduction in federal payroll. Outsource federal employment to employee leasing companies and reduce total compensation to average market levels. SS Retirement age changed for those under 46 years of age – adjusted to difference between average age of death (in 1937) and 65 years of age. Remove medical licensing requirements for those treating medicare/medicaid patients. Produce PDF version of Mao’s Barefoot Doctors Manual for distribution to all practitioners. I am not for ANY tax increase. It will only enable more spending. The mess will only get bigger. Argentina collapsed when revenues were 10% of public spending. Only hard limits of reality will cause politicians to change behavior. All of Europe will sink just like Greece. Actually, by rescuing Greece, the European Titanic is adding weight to its bowls making it sink a tad bit faster. Europe hit the iceberg a while ago. It is too late to do anything. The only actions that make sense in Europe are to secure a life boat and plunder the ship while she goes down. Unfortunately, I’m afraid that by the time Americans see all of Europe sinking like Greece, it will be too late to stop the American vicious cycle of (bigger government) -> (loss of prosperity) -> (voters feel pain) -> (voters ask for more government). So those of you who are mobile, stay so, and get ready to move to whatever country or continent emerges freer from this race to the bottom. Sorry to say this dear American friends, but, to elaborate on a comment posted earlier by “Rushdie”, compared to the Average-American, the Average-European is actually a rocket scientist. So if the welfare state has already crushed the competitiveness of the more competent Europeans, it seems inevitable that, decline for the less competent Americans will come much earlier. Way before Government to GDP ratios reach 50%. In other words, at a government size equal to that of the Europeans, even the Europeans themselves will beat the pants off you. Once you loose your top spot on the international competitiveness scale, decline will be swift. It will follow the classical vicious cycle, whereby, the greater the pain voters feel, the more they will turn to government for “help”, enslavement, and then in turn, further decline in competitiveness. There are roughly 200 nations in this world; and Americans had been the most prosperous of all for the last 100 years. Yet they never asked what seems the simplest, most obvious question: Why? That is, why alter a recipe (individualism) that has kept you the wealthiest nation in the world for 100 years and start copying the others?